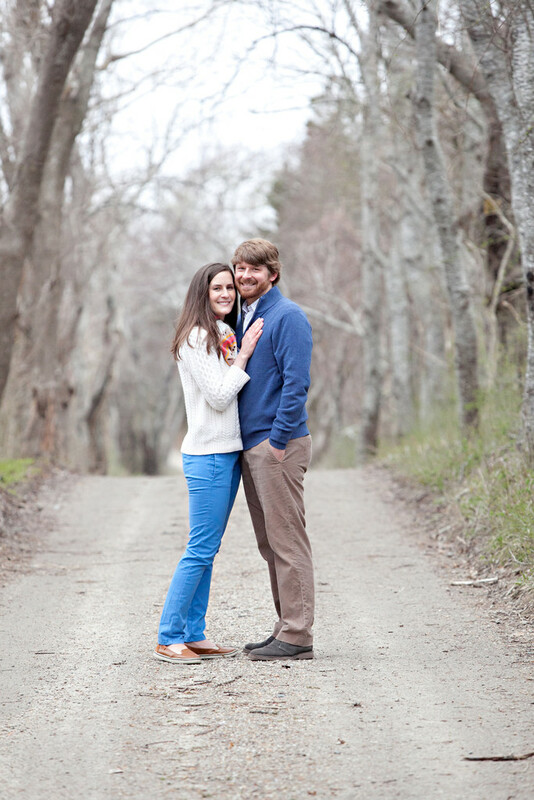 A couple standing on an a path near the beach in Yarmouth Ma having their engagement photos done. Since it was so cold and dreary down on the beach we decided to seek shelter up the road a little bit. As we were driving I found this little dirt road that had these really cool trees. We got out and I had them just naturally walk on the road and then get together for a couple quick engagement portrait photos. I love the color of their clothes and how they add an interesting element to the gray day that we had. Getting off the beach and seeking shelter really made a big difference in this photo shoot. They were no longer freezing cold and I was able to get some photos without her hair blowing on the beach. We did the shoot in the winter and I was a little hesitant that we wouldn't be able to find anything that made the photos interesting but dead trees, but who knew dead trees could look so cool background this photo is definitely when I'm going to enter into a competition. I shot with my long lens to blur out the background and make them really stand out.